Welcome to the Mom Pack - Link To Us! Various banner & buttons were created some of our talented members. Feel free to take whichever one you like best and display it proudly on your site to spread the word and to build a bigger, better network. You have everything to gain! To link to us, simply right click on any image below and save it to your hard drive on your computer. Then, upload it to your site, hyperlink it to http://mompack.com and save it. DO NOT direct link to our images - we have too many members to do this. 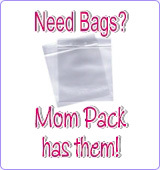 http://www.mompack.com. If you put our link on your main page and add yourself to our Mom 2 Mom Directory, then you too could be chosen for our Give Back Program awards. Thanks to Kanditraxel.com for creating this button! Thanks to Jess Sweetest Cupcake for this button! FritzerDesigns.com for creating this button!